Some familiar things have a hidden side. For example, one side of the moon has always faced away from the earth. For thousands of years no one, except perhaps some rare individual here or there, suspected the moon had a hidden side. With increased knowledge more people began to realize one side has always been hidden from our view. But only with the advent of space travel was actual knowledge about that hidden side acquired. Similarly, for hundreds of years, no one except perhaps some rare individual here or there, suspected Francis Bacon had a hidden side. With increased knowledge more people began to realize one side of Francis Bacon has always been hidden from our view. But only with the advent of the Baconians was actual knowledge about that hidden side acquired. "...let us be Diana's foresters, gentlemen of the shade, minions of the moon; and let men say we be men of good government, being governed,as the sea is, by our noble and chaste mistress the moon, under whose countenance we steal." And the prince acquiesces, saying, "..us that are the moon's men.."
Can we identify any of these "gentlemen of the shade"? Who were these people who worked behind the scenes with Francis Bacon? Is there a possibility of drawing any of them out of the shadow into the light? Major speculations about Bacon's connection with secret groups and secret societies have centered around the Freemasons and Rosicrucians. Is there any evidence to connect him with these groups? "The European phenomenon of Freemasonry almost certainly was connected with the Rosicrucian movement"
There have been persistent claims that Freemasonry, and to a lesser degree the Rosicrucians, were derived from the Knights Templar. But an atmosphere of confusion clouds the whole subject. There is a tangled undergrowth that needs to be cleared away before the subject can be seen clearly. The case is much the same with the subject of Bacon's association with Secret Societies as with his famous description of the knowledge of his time. There is a great need to tear the whole structure down, and build it anew from the foundation up. John Robinson presents a persuasive argument in his book, "Born in Blood" that Freemasonry was a secret society begun by the Knights Templars after they were suppressed. Interestingly Robinson distinguishes between aspects of Freemasonry ritual he says were originated by the Templars, and others added later, and it is just in these others that there exists the major part of the agreement with many of the detailed features of Bacon's ideas. It seems the Freemasonry ritual originated by the Templars to transmit a specific body of Templar knowledge continued relatively unchanged up to the time of Francis Bacon, and Francis Bacon altered the ritual to conceal in it certain knowledge he wished to transmit to later ages. Moreover, there is evidence the Rosicrucian Manifestos contain symbolism complementary to the knowledge Bacon concealed in the Masonic rituals. In order to make my case for this theory I will begin with the basic ideas in Bacon's works that are a prerequisite for understanding his thought. This model contained within it a twofold design that mirrored the world of his time,- the Old World centered around the Mediterranean Sea, and the New World (America) far west of the Pillars of Hercules. Bacon adopted the phrased "Plus Ultra" [more beyond] for his motto, in contrast to the "Non Plus Ultra" [no more beyond] of the ancients, who, restricted to voyages in the Mediterranean, had the phrase "Non Plus Ultra" on the Pillars of Hercules. Thus the frontispiece of his 1620 Novum Organum shows a ship sailing out beyond two pillars that depict the Pillars of Hercules. The Old World metaphorically dealt with knowledge from the ancient world while the New World the New World Metaphorically dealt with the future, New World of the Sciences to be discovered by Bacon's New Machine for the Intellect. The New Machine for the Intellect was the Intellectual Compass invented by Bacon to be used in guiding the Ship of Discovery to the discovery of new knowledge in the voyages on his Intellectual Globe. Moreover in connection with this model of the world he had invented a discovery device, an intellectual compass to be used in making the discovery of new arts and sciences as one navigated on his model of the world, his - Intellectual Globe. The stratagem of his plan required that a considerable period of time should pass before this machine for the intellect was activated in order that sufficient data from nature might be gathered before the machine was put into operation. "all the most ancient temples were intended to symbolize the Universe. Every temple was the world in miniature." "All temples were surrounded by pillars, recording the number of the constellations, the signs of the zodiac, the cycles of the planets; and each one was a microcosm or symbol of the Universe, having for roof or ceiling the starred vault of Heaven." All temples were originally open at the top, having for roof the sky. Twelve pillars described the belt of the zodiac. Whatever the number of the pillars, they were mystical everywhere." Mackey says the form was sometimes in the shape of a cross, emblematic of the four elements of which the earth is composed, and sometimes circular, but more generally an oval, as a representation of the mundane egg, which, in the ancient systems, was a symbol of the world. In the Zoroasteric mysteries of Persia, the temple of initiation was circular, being made to represent the universe; and the sun in the east, with the surrounding zodiac, formed an indispensable part of the ceremony of reception. In the Celtic mysteries of the Druids, the temple of initiation was either oval, to represent the mundane egg - or circular because the circle was a symbol of the universe. In the great mysteries of Eleusis, which were celebrated at Athens, St. Chrysostom along with other authorities says the temple of initiation was symbolic of the universe. This last information is particularly significant since Bacon allegorizes the Mysteries of Eleusis in the introductory play to the First Folio - The Tempest, and The Tempest is intimately connected with the symbolism of Freemasonry. "We neither dedicate nor raise a capitol or pyramid to the pride of man, but rear a holy temple in his mind, on the model of the universe, which model therefore we imitate." This is the legend that is now almost universally accepted by the great mass of the Masonic Fraternity." The Ark of the Covenant came first. Then the Tabernacle (tent) in the Wilderness was built to house the Ark of the Covenant. Intended as Israel's "temporary temple", the Tabernacle remained for 450 years, before David, power base consolidated, conceived the ambition of building a magnificent and permanent temple. David was embarrassed by the contrast between his luxurious dwelling as king of Israel, and the dwelling of the Ark of the Covenant. He said, "I dwell in a house of cedar, but the Ark of God dwells within curtains". Unfortunately for David's ambition he was barred from building the temple to the Lord he wanted to build because he was stained with the blood of his enemies. So the task fell to his son - Solomon, and the chosen site was on Mount Moriah.. Since the Tabernacle in the Wilderness was the prototype for the Temple of Solomon, and its main purpose was to house the Ark of the Covenant, the Ark has an important bearing on the Temple of Solomon, and merits close examination. The significant thing about the Ark is that as constructed by Moses it was a replica of an ancient device known in the Egyptian Temples. Bas-reliefs on the Temple of Philae show Egyptian priests carrying an Ark that closely resembles that of Moses even to the kneeling figures upon its lid. When we consult sources that give us more information about the Ark of the Covenant contemporary ideas about the primitive state of knowledge at the time of Moses crash and burn. "The superstitious belief of the ancients, if it existed at all, can therefore not be taken as reliable proof of their ignorance, but just how much they knew about electricity can only be conjectured. A curious fact is that the ray or torpedo fish was used by them in electrotherapy. Some old coins show twin stars, or sparks, such as might be produced by a galvanic battery. The records, though scanty, are of a nature to fill us with conviction that a few initiated, at least, had a deeper knowledge of amber phenomena. To mention one, Moses was undoubtedly a practical and skillful electrician far in advance of his time. The Bible describes precisely, and minutely, arrangements constituting a machine in which electricity was generated by friction of air against silk curtains, and stored in a box constructed like a condenser. It is very plausible to assume that the sons of Aaron were killed by a high-tension discharge, and that the vestal fires of the Romans were electrical." "According to Maurice Denis-Papin, descendant of the famous inventor, the Ark of the Covenant was a sort of electric capacitor capable of producing an electrical charge of 500 to 700 volts.The Ark is said to have been made of acacia wood, lined inside and out with gold: that is to say, two conductors separated by an insulator. On either side were garlands which may have served as condensers.Denis-Papin says the Ark was placed in a dry spot where the magnetic field reached a normal 500 to 600 volts per vertical meter. Insulated from the ground, the Ark is said to have given off fiery rays, acting like a Leyden jar. According to Denis-Papin the capacitor was discharged into the earth by means of garlands. To move the Ark, two golden rods were slid through rings attached to the exterior." Just what was the Ark of the Covenant? The minds of the Jews associated with Moses (recently released, uneducated slaves) were at a primitive and superstitious level. Moses, an Initiate, learned in all the knowledge of the Egyptian Temple Lore, followed the course of religious leaders in all ages who have applied the leverage of their special knowledge as subterfuge to keep their followers in line with their plans. The Egyptians had secret technical knowledge handed down in the temples for thousands of years. Evidence suggests The Ark of the Covenant was some type of electronic device. It was a small chest of acacia wood, 27 inches long, 16.2 inches in height, and 16.2 inches in width. The mercy seat, where the person sat who was using the Ark, was on the top of the chest, and we must not forget the two Cherubims, one on each side of the mercy seat, that suggests the two poles in an electrical mechanism. The phenomena associated with the device suggests arcs of electrical energy may have played upon the person in the Mercy Seat from each of the Cherubims, plus he was apparently surrounded by a coruscating electromagnetic field . Since the Ark of the Covenant was ostensibly used for the purpose of making contact with God, the best idea of the Ark might be that it was a communication chest - a communication device. However, it was not a communication device of the kind (radio, for example) we are familiar with. It was a device for enhancing psychic energy, as is evident from the healing functions attributed to the Ark. An interesting book by Elisabeth Haich titled, "Initiation" has a good deal of interesting information about the Ark. According to Haich she had recovered memories from a life in ancient Egypt. In this life she passed through an initiation ceremony which endowed her with a higher state of consciousness. The Ark was the device used by the priest to energize her, bringing about the higher state of consciousness. Strange phenomena were associated with the operation of the Ark of the Covenant. Biblical and other archaic sources speak of the Ark blazing with fire and light. Apparently when Moses used the Ark of the Covenant he sat between arcs of electrical energy that played upon his body, amid an electromagnetic field that coruscated with electrical fire. Curiously the phenomena associated with God when Moses went apart on the mount seems to have been identical with the phenomena associated with the Ark of the Covenant. There was a burning bush, lightning, a smoke-like mist, and the other features associated with the Ark. If we reject religious superstition the most plausible conclusion is the primitive minded Jews were led by Moses into confusing the phenomena of the Ark with phenomena coming from God. Most likely, in view of the spectacular side effects, Moses wanted a place of seclusion to use the Ark device. This was the rationale for going apart to the mount, and for building the Tabernacle (tent) in the Wilderness. But the question as to who, or what, he communicated with is a moot point. Certainly David thought it was God - note he refers to "the ark of God". But this may have been part of the tradition of superstition that Moses fostered and encouraged. For those who can read between the lines, the Bible itself seems to give the best clue as to the correct interpretation. "And thou shalt make curtains of goats' hair to be a tent covering the tabernacle: eleven curtains shalt thou make. The length of one curtain shall be thirty cubits, and the width four cubits: and the eleven curtains shall all be of one measure. And thou shalt couple five curtains by themselves, and six by themselves, and shalt lay the sixth curtain double over the front side of the tent." All of this detail indicates secret intent. A close examination reveals the diagonal of the twice mentioned second curtain (30 cubits by 24 cubits) yields a very significant angle. This angle is the pitch of the side of the Great Pyramid! The side of the Great Pyramid has a pitch of 51 degrees, and 51 minutes, and the diagonal of any rectangle constructed in the proportion of 30 x 24 has the same pitch. (For more detail see, "The Secrets of Ancient Geometry" by Tons Brunes. He says the version above is from a translation of the original Hebrew canon by Danish scholar, Dr. Frants P.W. Buhl, of the Universities of Copenhagen and Leipzig, who corrected discrepancies between the Hebrew and Danish/English translations, which had been taken mainly from Latin). It was customary among initiates to leave a secret sign of the school from which they received their doctrine. Obviously the temple school of Moses, who was learned in all the knowledge of the Egyptians, was the Great Pyramid School, the oldest and most venerated of them all. Apparently this was the fountainhead from which the secret knowledge flowed that was eventually set in stone in the Temple of Solomon. In my opinion it was the priests of the Great Pyramid Temple, not God, that Moses communicated with while on the mount, and they gave him the specs for the Tabernacle in the Wilderness. Many articles and books have been written about the Great Pyramid. In, "Secrets of the Great Pyramid" Peter Tompkins surveys and summarizes this literature and concludes that externally the Great Pyramid was a scale model both of the northern hemisphere and of the solar system, with the incorporation in its structure of an amazing array of physical laws; many discovered by modern science only in the most recent era. According to Tomkins, concealed in the structure of this strange edifice was the proof that men, at approximately 10,500 B.C. had known the precise circumference of the earth; the varying lengths of degrees of latitudes and longitude at different locations on the planet; how to make excellent maps, projecting with a minimum of distortion; the length of the year to several decimals; the length of the great year of the precession. And a great deal more besides. "Here is the perfectly rounded sphere which reveals the eternal pattern of the universe." This expresses the essence of Sacred Geometry. It dealt with "The Eternal Pattern of The Universe". It not only embodied essential mathematical and geometrical principles present in the natural operations of growth throughout nature, but these same essential mathematical formulae were incorporated, along with the macrocosm-microcosm idea, in a wide array of ancient sacred structures and temples. Perhaps the foremost proponent of Sacred Geometry in modern times (as regards the esoteric traditions of ancient Egypt) was R. A. Schwaller de Lubicz. This remarkable man stored the result of decades of study of ancient Egyptian temples in his monumental work "Le Temple de l'Homme". He demonstrated many Egyptian temples, and in particular The Temple of Luxor, were indisputably devoted to the Human Microcosm (some studies show the Temple of Solomon was also based on the Human Microcosm), and shows that the sacred proportion - the golden number that was built into the structure of these temples was not the product of mathematical imagination but of the natural principles of the laws of equilibrium. De Lubicz discovered that the laws in nature of sacred geometry were embodied in such an astonishingly detailed manner in Egyptian temples that even each individual stone had a value and a significance. Madame H. P. Blavatsky compared the measurements of the Tabernacle with those of the Great Pyramid both of which were constructed upon the same abstract formula derived from the number of years in the precessional cycle, and on integral values of pi (the ratio of the circumference of a circle to the diameter) and says Moses symbolized these "under the form and measurements of the tabernacle constructed in the wilderness. On these data the later Jewish High Priests constructed the Temple of Solomon. Blavatsky says if the measurements of this allegorical temple, the symbol of the cycle of Initiation, coincide with those of the Great Pyramid, it was due to the fact that the former were derived from the latter through the Tabernacle of Moses (SD 1:314-5). She refers to "the undeniable, clear, and mathematical proofs that the esoteric foundations, or the system used in the building of the Great Pyramid, and the architectural measurements in the Temple of Solomon, Noah's ark, and the ark of the Covenant, are the same" (SD 2:465). More detail can be found in the section of The Temple of Solomon in "The Source of Measures" by J. Ralston Skinner. The Temple took seven years to complete. It was a veritable Tabernacle in wood and stone in the shape of an oblong rectangle. The compartments of the Tabernacle were replicated in King Solomon's Temple, but twice as large. There was only one entrance - through the Porch which faced due east, or the rising sun, as with all Eastern temples.. The other end faced due west, and the long sides north and south. On the porch at either side of the entrance was a huge pillar of brass. The measurements of the temple were in cubits, but unlike the standard cubit of 1 1/2 feet, temple cubits were 14.4 inches. The porch gave entrance into the Holy Place, which was 40 cubits long, 20 cubits wide and 30 cubits high (48 feet long, 24 feet wide, 36 feet high) and lit by latticed windows near the ceiling. This hall, accessible only to priests, was used for daily worship, for religious ritual and for the presentation of offerings. At the western end of the building the Holy of Holies was a perfect cube of 20x20x20 cubits (24 feet by 24 feet by 24 feet) set on a podium to maintain the same ceiling line as Holy Place, and separated by a veil. There were no windows in the Holy of Holies. It received light only from the Holy Place when the veil were open, and was only entered by the high priest once a year.. There is a tradition among the mystics of Israel that the "pattern" from the mount, "given by God to Moses" as a prototype for the tabernacle, was recorded with detailed drawings and diagrams on a "Temple Scroll" and handed down from generation to generation. According to the tradition this was the prototype David ordered Solomon to use as the plan for his temple. Jewish tradition relates that a secret vault was constructed beneath the Temple of Solomon to provide secure storage of all secret treasures and documents, and this tradition says the "Temple Scroll" with the detailed drawings and diagrams for the tabernacle in the wilderness was stored here. Recent seismological surveys indicate there probably is a cavern beneath the location where the Temple of Solomon formerly stood, but no excavations have been made to confirm the existence of the traditional vault. And King Solomon sent and fetched Hiram of Tyre. He was a widow's son of the tribe of Naphtali, and his father was a man of Tyre, a worker in brass: and he was filled with wisdom and understanding and cunning to work all works in brass, and he came to King Solomon, and wrought all his works. For he cast two pillars of brass, of eighteen cubits high apiece: and a line of twelve cubits did compass either of them about. (I Kings 7;13-15). Although these Pillars, as well as many other objects, are described as having been made of "brass", this term is an improper translation of the word "Nehosheth,". Since the Hebrews were not acquainted with the metal zinc, which with copper forms the compound known as "brass." the metal was probably bronze. "And he set up the pillars in the porch of the temple: and he set up the right pillar, and called the name thereof Jachin and he set up the left pillar, and called the name thereof Boaz." -- I Kings 7:21. Jachin was on the south, and Boaz was on the North. Masons attribute them with black and white on opposing sides symbolizing the illusions of duality. These Pillars were hollow. The upper part, or capital, was a bowl, cast in the form of a lotus-flower, or tulip. This was probably derived from the sacred flower of Egypt, and was the "lily-work" of I Kings vii, 19. They were not surmounted by spherical balls representing the terrestrial and celestial globes as is present in the pillars of the Masonic temples, but by bowls in the form of lotus blooms . These bowls were probably vessels to contain oil, which could be lit at night. Herodotus, writing around 450 BC, describes two large pillars near the temple of Hercules at Tyre which "shone at night". The two immense pillars would have illuminated the facade of Solomon's Temple on Mount Moriah at night, and would have caught the first glint of the Jerusalem sunrise. They would have been seen as sacred obelisks, their blazing smoking wicks recalling to worshippers the pillars of fire and cloud that led the Israelites of old through the wilderness. "The principal entrance to the lodge room ought to face the east, because the east is a place of light both physical and moral; and therefore the brethren have access to the lodge by that entrance, as a symbol of mental illumination." In connection with the Bacon's basic ideas this reversal in orientation is very significant, as I will demonstrate at the proper place in this article. No doubt, this was why Bacon reversed the orientation. In the Right, or South, side of the Porch, in the corner, not visible from the front of the entrance, was the spiral stairway, described as a "winding stairs", leading to the floor above the Porch. This "winding stair" is referred to in I Kings vi, 8, "the door of the middle chamber" which "was in the right side of the house, and went up the winding stairs into the middle chamber", and is reflected in the structure of the Masonic lodge and their ritual dealing with the "winding stair". Solomon's temple stood from 960 until 587 BC, when it was completely destroyed during the Babylonian conquest by the Babylonian King, Nebuchadnezzar. Jerusalem was burned. The Jews were led off into captivity in Babylon. All contents of the temple were taken off as loot. The Ark itself was lost for ever. The Temple was then rebuilt in 537 BC by King Zerubbabel after the Jews returned from captivity, but in such modest conditions that it was said the ancients who had seen the former Temple wept. In 19 BC, King Herod destroyed the Temple of Zerubbabel to begin work to replace it by another which would equal, if not surpass in splendor, the original temple. Herod's temple was finally completed in AD 66, but was destroyed only four years later, during the Jewish revolt against the Romans. Only the foundation of the west wall remains. Jews go there today to lament the second temple's destruction - it is now known as the wailing wall. Near the beginning of the crusades, after Jerusalem was captured, nine French Crusaders appeared before King Baldwin of Jerusalem. They asked for quarters in the east wing of his palace, adjacent to the recently captured Al-Aqsa Mosque, (former site of King Solomon's Temple) so they could protect pilgrims traveling to the Holy Land.. Their request was granted. They became known as the Knights of the Temple, soon shortened to Knights Templar. However, during the first nine years of their existence, they neither recruited new members nor protected pilgrims traveling to the Holy Land. Instead they kept close to their quarters and conducted extensive excavations beneath the former site of King Solomon's Temple. This is not conjecture. In 1894 a group of British Royal Engineers led by a Lieutenant Charles Wilson discovered extensive evidence of the Templars while mapping vaults under Mount Moriah. They found vaulted passageways with keystone arches, typical of Templar handiwork, and also artifacts consisting of a spur, parts of a sword and lance, and a small Templar cross, which are still on display in Scotland. Obviously the Templars were familiar with the tradition of a secret vault beneath Temple of Solomon. Moreover, evidence is not wanting that the Templars found this vault. Several accounts claim they acquired scrolls of hidden knowledge. There has been speculation from time to time that they recovered the Ark of the Covenant. However, Graham Hancock makes a good case in "The Sign and the Seal" that it disappeared much earlier. The Templars were founded by Hugues de Payen, a noble knight from Champagne, and eight other knights, around 1119. In 1128 Hugues de Payens came back to France. Isabel Cooper-Oakley in her, "Masonry & Medieval Mysticism - Traces of a Hidden Tradition" provides evidence that the Knight Templars were divided into two divisions - the military and the sacerdotal, and the latter division had in its possession a great deal of secrets and mystical learning of the Order. There is evidence the Templars built extensively using their own teams of masons, constructing their own castles and preceptories. After the Templars returned to France, during one hundred and fifty years more or less, came what has been called the miracle of the Gothic flowering. The great cathedrals began to appear with a new style of architecture which had never appeared in Europe before. This architecture embodied the ancient sacred geometry. Unlike other new art forms, the Gothic style of architecture appeared at one blow, complete, and whole throughout the West. A number of students have connected the Templars with this new architecture style. The implicit seems to be the Templars did indeed recover the ancient "Temple Scroll", possibly along with other manuscripts that had been hidden in the vault beneath the Temple of Solomon, and promulgated the ancient architectural secrets of sacred geometry, recorded in that scroll, in the flowering of the great cathedrals that began to appear throughout Europe. There is evidence that the Templars had close contacts with Islam during their stay in the Holy Land and imbibed deeply of the wisdom of the Sufis. The synagogue and the mosque were both based on geometric principles and abstract mathematical relationships. The maze, the arabesque, the chessboard, the arch, and the pillar or column were pure embodiments of symmetry, regularity, balance, and proportion. The knowledge of the Templars was not restricted to "Sacred Geometry" or to the wisdom they may have imbibed from the Sufis. The Templars Master Mystics closely connected with the court of the count of Champagne in Troyes. Here an influential school of Cabalistic and esoteric studies, had flourished since 1070. It was here, at the Council of Troyes in 1128, that the Templars were officially incorporated, and for the next two centuries Troyes remained a strategic center for the order. After those initial years at their inception the order of the Knights Templar grew quickly. By 1130 some 300 Templar knights were in Palestine. They were tough, brilliant fighters. The Knights Templar gained great wealth and power. Then on October 13, 1307 King Philip IV of France with the support of Pope Clement V arrested large numbers of Templars in coordinated raids. The Templars had become enormously wealthy and had used their wealth to establish a major banking operation. They had loaned massive amounts of money to King Philip IV, and he not only wanted to rid himself of his debt, but he also wanted to seize their treasure to finance his continental wars against Edward I of England. However, since the Knights had a sterling public reputation he had to justify his actions. He had the Templars arrested, charged with heresy, and subjected to hideous torture so they would confess to this and the other heinous crimes he had invented to charge them with. Understandably the Templars subjected to these fiendish tortures, who did not die in the process, ultimately confessed to anything the torturers wanted them to confess to. To put to rest all rumors that the Templars were not actually guilty but rather had been the victims of greed-motivated persecution, it was decided to have the Grand Master of the Templars make his confession (that had already been made privately) publicly before the world. The nobility, prelates of the church, and influential commoners were convened on March 14, 1314 to witness the historic event. A high platform had been erected in front of the great cathedral of Notre Dame from which Jacques de Molay was to confess his shame, so that all the world would know the Templars was indeed guilty of gross obscenities and heresies. "I think it only right that at so solemn a moment when my life has so little time to run I should reveal the deception which has been practiced and speak up for the truth. Before heaven and earth and all of you here as my witness, I admit that I am guilty of the grossest iniquity. But the iniquity is that I have lied in admitting the disgusting charges laid against the Order. I declare, and I must declare, that the Order is innocent. Its purity and saintliness are beyond question. I have indeed confessed that the Order is guilty, but I have done so only to save myself from terrible tortures by saying what my enemies wished me to say. Other knights who have retracted their confessions have been led to the stake, yet the thought of dying is not so awful that I shall confess to foul crimes which have never been committed. Life is offered to me, but at the price of infamy. At such a price, life is not worth having. I do not grieve that I must die if life can be bought only by piling one lie upon another." In the tumult that followed, Brother de Charney shouted out his own retraction and assertion of innocence of the order, as he and de Molay were hustled off the platform. They had brought a monumental embarrassment to both the king and church. That same evening their executions were held on a small island in the River Seine. The fires were carefully prepared of dry, seasoned wood and charcoal to make a low smokeless pyre of intense heat, calculated first to blister the legs and to draw out the torture by slow roasting from the ground up. De Molay and de Charney continued to shout out the innocence of their order as long as they were able. Then when the pain became so unbearable it stripped away their rationality and reduced them to mere animals in pain, they could only scream for an interminable period that must have seemed an eternity. There is evidence there was sufficient warning for many of the Templars to have time to escape. A highly significant point is they managed to carry their treasure away and it was never found. If it was true that The "Temple Scroll" was recovered by the Templars and was a source of the Sacred Geometry in their buildings, it certainly was certainly not true that the sole source for Sacred Geometry was the Templars. A major source was the Roman architect - Vitruvius. Toward the end of the first century BC, Vitruvius defined what became the most basic premise for later builders. He established architecture as more than mere technical skill. The architect, would be more than, "a skillful draughts man, or mathematician". For Vitruvius the architect was a species of magus, learned not only in all human knowledge, but also in creation's underlying laws, among which were the secret laws of geometry on which the architect would construct temples through a knowledge of the sacred laws of "proportion and symmetry." "That branch of Masonry which comprises the degrees of Entered Apprentice, Fellow Craft and Master Mason, may justly claim an antiquity surpassing that of all other societies." 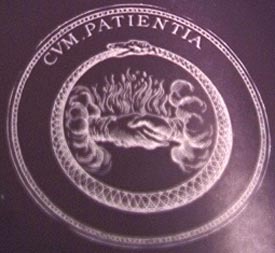 Further indication of the early inception of these three degrees is their Ancient Mystery symbolism. The Ancient Mysteries customarily had three degrees. Since the Freemasonry rituals incorporate Ancient Mystery symbolism it is plausible that from their inception they were designed around three degrees. Some authorities claim there was only one degree, and the other two were added after Freemasonry went public in 1717, But the most incontrovertible proof of the fact that the three degrees existed at the time of Bacon is that The Tempest contains allusions to incidents from all three blue lodge degrees. According to Albert Mackey (probably the foremost scholar in the field), these three degrees are so called because they alone are supposed to have been practiced by the "ancient craft". They are the original degrees of the old "Blue Lodge" (the blue lodge was so named because the sky provided the ceiling for these lodges). We need to have a certain degree of familiarity and understanding of these before going further in our investigation. Space limitations mandate abridgment of this material. This has inherent the danger of omitting something vital. The author of the Freemasonry rituals was a master symbolist. Freemasonry presents instruction through allegory and symbol. Most are left to the interpretation of the initiate, and most Freemasons exist in a state of blissful ignorance concerning the significance of the ceremonies and rituals through which they pass. They are as innocent of any realization of this ignorance about the meaning of the rituals as a baby is of a realization of the questionable state of its diaper. A good example of light falling on blind brains is the matter of the position of the candidate as he listens to the lecture that follows the initiation. He is positioned in the North-East corner of the lodge where he stands with his feet positioned at a right angle. This small matter is supercharged with symbolism and profound meaning, but the sole crumb of meaning thrown to the candidate are a few words from the Worshipful Master in the lecture following the initiation who tells him that his denotes the cornerstone of the building, and since the first stone of a building is usually laid in the North-East corner he was, accordingly, placed there to receive his first instruction. There is much more to this. The cornerstone, as the foundation on which the entire building rests, is the most important stone in the entire building. It was always laid with impressive ceremonies. One side of the cornerstone faces due North, and the other due East. The North as the point in the horizon most remote from the rays of the sun when at its meridian height was denoted by the masons as the place of darkness, while the East, facing the rising sun, was denoted as the place of light. This symbolizes the situation of man in the world between the opposing forces of light and dark. The cornerstone must be perfectly square on its surface, since any deviation would mean the walls erected upon it would deviate from the mandatory perpendicular line of the building. Therefore the cornerstone must be a perfect cube. Unfolded the cube becomes a cross. The four directions of the cross denotes both the four elements, from which everything was believed to have been made in ancient times, and the directions of the four winds from the four cardinal points of the compass. Therefore the cross symbolized the world, and the symbolic identity of the candidate with the cube/cross symbolized he was a microcosm of the world. Symbolically the Freemason must chip away all irregularity from his character so that he is a perfect cube denoting that, having fashioned himself into a perfect reflection of the macrocosm he becomes a perfect microcosm of the world, or of the universe. But how many Masons understand that all of this is contained in the small matter of their position in the North-East corner of the Lodge? "The connection of the globes on the columns, Jachin and Boaz, or the columns themselves, with the moon and the sun, seems to have been at one time fully acknowledged, if not understood, by the Fraternity." This information becomes important due to the depiction of the moon and sun in connection with the two pillars in the illustrations on the original editions of Francis Bacon's "Advancement of Learning." Even without regards to the wealth of other evidence, this is strong evidence of Bacon's connection with the Freemasonry. In the 1624 edition of Bacon's "De Augmentis" there was a very significant illustration. It had a large oval in the center. Inside the oval was a crown on a large fleur-de-lys,. Around the border of the oval were words proclaiming Bacon as the "Instaurator of all Arts". Immediately below was another, smaller oval. In this oval was a curious design with the letters "IM" and immediately below it a Masonic compass and square as they are customarily displayed on the altar in the Masonic lodges. What can this mean, if not - "I'm a Mason"? And it means more. The fleur-de-lys was the conventional symbol for the direction of North on a compass. North was related to the idea of darkness and of night. The symbol associates Bacon with the two ideas of king and night. This could mean he was a hidden king, recalling the Baconian theory that he was the son of Queen Elizabeth, but it could also have additional meanings. The play, Love's Labor Lost has the phrase, "The School of Night". In one sense Freemasonry was The School of Night. In Freemasonry the candidate for initiation began in darkness and moved ever toward more light. In another sense The School of Night designated Sir Walter Raleigh's group - a theory espoused by a number of writers on the subject. (See especially Frances Yates, "A Study of Love's Labor Lost"). In yet another sense it refers to the "Starry Science". The body of ancient esoteric lore that could be read from the stars at night. (I will describe this later). What is important to realize here is the symbol gives clear evidence Bacon was the Monarch of Masonry, and possibly other related areas of knowledge. The title page of Gilbert Watt's 1640 edition of Bacon's "De Augmentis" was packed with Masonic symbolism (401k colorised). There is a design which very obviously represents the two Masonic pillars including the globe at the top of each, one associated with the moon, the other is associated with the sun. But, instead of two pillars, the illustration has two obelisks showing the designer of the illustration was familiar with the derivation of the two pillars from the traditional pair of obelisks that fronted the entrances to Egyptian temples such as the temple at Luxor. Another point connecting Bacon with Freemasonry is he took with his title of Lord Verulam the name St. Alban. Note, he did not take the name of the town St. Albans which would have been expected since he lived in that area, but the name of the saint. This Saint had a major role in Masonic tradition. According to Masonic tradition, St. Alban, who lived in the 3rd century AD, was a great patron of Masonry, and "gave them charges". One meaning of this phrase is he framed a constitution for them. Another equally valid meaning is - he gave them some of their traditions - for this is exactly what the "old charges" of Freemasonry were - a body of traditional material. Entrance into a Masonic lodge passes between the two columns, representing Jachin and Boaz, those great brass columns that flanked the outer porch of the Temple of Solomon. On each respective column is a globe. One globe is a map of the world, the other a map of the heavens. Inside the columns to the right a spiral staircase leads up to the Middle Chamber. 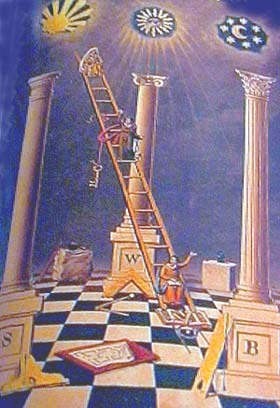 Significantly, there is also a ladder (not mentioned in the Bible) in the Masonic symbolism. The ladder connects the ground floor of the lodge with its roof, but symbolically the ladder is Jacob's Ladder by which the Mason hopes to climb at some future date to heaven. The floor of the lodge is of a chessboard design, with alternating black and white squares. All Master Masons are known as Sons of the Widow. This is in allusion to Hiram Abiff, the Biblical builder of Solomon's Temple who was the Son of a Widow. Symbolically, all Master Masons are engaged in building the Temple of Solomon just as was Hiram Abiff, and in the third degree, all Master Masons symbolically become Hiram Abiff, just as Initiates at Eleusis became Demeter. On entering a Masonic Lodge, the first object that attracts one's attention is the altar. The altar is in the center of the room, midway between the East and West, and North and South. On the East, West, and South sides of the altar were formerly three burning candles, now usually been replaced with electric lights. On the altar is always a copy of the Holy Bible - closed when no ritual is taking place, but open during the rituals. On the Bible is always a Square and Compass. These instruments are displayed lying on the altar in such a manner that the legs of the compass point downward while those of square point upward, and these overlap making a diamond shape in the center. Having described these in detail for the Entered Apprentice, it would be repetition to repeat them for the Fellow Craft, and Master Mason degrees.. Also, certain parts of the lecture are not relevant to my argument. In some instances I will omit these. The second and third degree (the third especially) are much longer and more complicated than the first. Therefore, while I describe the first degree in detail, in order to conserve space I will only describe the selected parts of the second and third degrees that are needed for the purposes of my argument. When the candidate has been prepared for the initiation in the "preparation room", three knocks at the door to the Lodge, followed by the appropriate password, is required to gain entrance. Passwords differ for all three degrees. Freemasonry also has signs and tokens such as the "Due Guard", the "Sign of an Entered Apprentice", and so on. I omit these as non-relevant to my argument. At various points in the ceremonies raps are given with a gavel. In the opening ceremonies of each of the three degrees, one rap calls the lodge to order and seats them when standing. In opening and closing ceremonies one rap also calls up any member addressed by the Master, two raps call up all the subordinate officers; and three raps call up the entire lodge. Symbolically the place where the Entered Apprentice degree takes place is the "ground floor" of King Solomon's Temple; while the Fellow Craft degree takes place in the "middle chamber", and the Master Mason degree takes place in the "Holy of Holies". Since the whole system is symbolic, all of this has reference to the building of the temple within the Mason. Purging the Lodge - The Senior Warden verify that all present are Entered Apprentices [or Fellow Craft, or Master Mason depending on the initiation degree] and report this back to the Worshipful Master. The Worshipful Master then gives one rap of his gavel and orders, "Brother Senior Deacon and Junior Deacon, you will approach the Worshipful Master, you will communicate to him in a whisper the pass [password] of an Entered Apprentice [or the appropriate degree]. You will now demand it with the same caution of the brethren on the right and left, except the Junior Warden, who will communicate it to the Worshipful Master in the East. Tyling the Lodge consists of the Worshipful Master giving one rap with his rod and querying the Junior Deacon: "Brother Junior Deacon. What is the first great care of Masons when convened? Junior Deacon: "To see that the Lodge is tyled Worshipful." ____, on the first degree of Masonry, and direct him to take due notice and tyle accordingly." The Junior Deacon opens the door, without knocking, puts out his head and whispers to the Tyler, who is standing outside the door, that the lodge is about to be opened on the first degree. He then closes the door and gives three distinct knocks, which are answered by the Tyler with three distinct knocks. The Junior Deacon then gives one knock, which is answered with one knock by the Tyler, whereupon the Junior Deacon faces toward the East and reports: "The Lodge is tyled, Worshipful." Junior Deacon: "By a Master Mason, armed with the proper implement [a sword] of his office." Worshipful Master: "The Tyler's Station?" Junior Deacon: "Outside the inner door, with a drawn sword in his hand." or repass, but such as are duly qualified, and have permission." Junior Deacon takes his seat. Lecturing the Lodge proceeds as follows: The Worshipful Master gives one rap of his gavel and asks, "Brother Junior Deacon, what is the first great care of Masons when in Lodge assembled? Worshipful Master: What do you conceal? "The Worshipful Master, Senior Warden, Junior Warden, Treasurer, Secretary, Senior Deacon and Junior Deacon." Each officer, has his set place in the lodge. His duties are now defined. The Junior Deacon is located on the right of the Senior Warden in the West. He carries messages from the Senior Warden in the West to the Junior Warden in the South, and elsewhere as required. The Senior Deacon is located on the right of the Worshipful Master in the East. His carries orders from the Worshipful Master in the East to the Senior Warden in the West, and elsewhere as required. The secretary is located on the left of the Worshipful Master in the East. He records the proceedings of the lodge and serves at the behest of the Worshipful Master. The Treasurer is located on the right of the Worshipful Master in the East. He receives and handles all moneys. The candidate is escorted into the Preparation Room. There he is stripped of all his clothes and dressed only in shorts with his left foot bare and a slipper on his right foot. Then a blindfold [called a hoodwink by Masons] is fastened securely over his eyes. Last of all the noose of a small rope called a cable-tow is wound once around his neck. Thus prepared, the Junior Warden seizes the cable-tow and leads him by it to the door of the Lodge. The Junior Warden then tells him to make a fist with his right hand, holds his right hand, and with the knuckles of this hand gives three distinct raps on the door. Senior Deacon: (rising to his feet inside the Lodge): Worshipful Master, there is an alarm at the door of the preparation room. Worshipful Master: Brother Senior Deacon attend to the alarm and report the cause. Senior Deacon:(approaches the door and gives three distinct raps with his rod): Who comes here? Mr. ___ who has long been in darkness, and now seeks to be brought to light and to receive a part in the rights and benefits of this Worshipful Lodge, erected to God and dedicated to the Saints John, as all brothers and fellows have done before. Worshipful Master, the alarm was caused by Mr. ___ who has long been in darkness, and now seeks to be brought to light and to receive a part in the rights and benefits of this Worshipful Lodge, erected to God, and dedicated to the Saints John, as all brothers and fellows have done before. Worshipful Master: Brother Senior Deacon, is this of his own free will and accord? It is well. Since he comes endowed with all these necessary qualifications, it is my order that he enter this Lodge in the name of the Lord, and be received in due form. Senior Deacon: (returning to and opening door): It is the order of the Worshipful Master that the candidate enter this Lodge in the name of the Lord, and be received in due form. The candidate is then led into the Lodge-room by the cable-tow and halted some six or eight feet from the door. "Rite of Induction", or "Shock of Entrance"
Mr. ___, upon your first admission into a Lodge of Masons, I receive you upon the point of a sharp instrument pressing your naked left breast which is to teach you that, as this is an instrument of torture to your flesh, so should the recollection of it be to your conscience, should you ever presume to reveal any of the secrets of Freemasonry unlawfully. Worshipful Master: My friend, no man should ever enter upon any great important understanding without first invoking the blessing of Deity. You will be conducted to the center of the lodge, caused to kneel and attend prayer. After this takes place, there follows a most import rite. "A Lodge has three lights situated in the East, West, and South. There is none in the North, because of the situation of King Solomon's Temple, which was place so farNorth of the ecliptic that neither sun nor moon at meridian height could dart any rays into the North portion thereof. The North therefore, we Masonically term a place of darkness." Having arrived at the end of the circumambulation at the South, the Deacon gives one rap with his rod on the floor, and the Junior Warden, rising to his feet, demands: "Who comes here?" "Mr. ___ who has long been in darkness, and now seeks to be brought to light, and to receive a part in the rights and benefits of this Worshipful Lodge, erected to God and dedicated to the Saints John, as all brothers and fellows have done before." "It is well. Since he comes endowed with all these necessary qualifications, it is my order that you re-conduct him to the Senior Warden in the West, who will teach him how to approach the East by one upright, regular step, his feet forming the angle of a square, his body erect, at the altar before the Worshipful Master." "Brother Senior Warden, it is the order of the Worshipful Master that you teach the candidate to approach the East by one upright, regular step, his feet forming the angle of a square, his body erect, at the altar before the Worshipful Master." "Brother Senior Deacon, you will face the candidate to the East. (The candidate is faced about.) Mr. ___ you will step off one step with your left foot, bringing the heel of the right to the hollow of the left, forming the angle of a square. Stand erect. (The Senior Deacon places his feet as required.) Stand erect - in order, Worshipful. "Mr. ___, you are now at the altar of Masonry for the first time; but before proceeding further in our solemn ceremonies, it becomes my duty, as Worshipful Master of this Lodge, to inform you that, it will be necessary that you take on yourself the solemn oath or obligation pertaining to this degree. And I can assure you upon the honor of a man and a Mason, that in this obligation there is nothing that will conflict with any duty you owe to God, your country, your family, your neighbor, or yourself. In your advancement thus far, you have repeatedly assured us, it was of your own free will and accord. If you are still of the same mind, you will advance to our altar. (He is led to the altar by his guide, the Senior Deacon.) Kneel upon your naked left knee, your right forming a square, your left hand supporting the Holy Bible, Square and Compasses, your right resting thereon (the Senior Deacon places the candidate in these different positions), in which due form you will say 'I," repeat your name and say after me"
"I, Mr. ___, of my own free will and accord, in the presence of Almighty God and his Worshipful Lodge, erected to Him and dedicated to the Saints John, do hereby and hereon (here the Master places his right hand on that of the candidate), most solemnly and sincerely promise and swear, that I will always hail, ever conceal, and never reveal, any of the secret arts, parts or points of the hidden mysteries of Ancient Freemasonry, which have been heretofore, may at this time, or shall at any future period, be communicated to me as such, to any person or persons whomsoever, except it be to a true and lawful brother of this degree, or within a regularly constituted Lodge of Masons, and neither to him nor them, until by strict trial, due examination, or legal information, I shall have found him or them as lawfully entitled to the same as I am myself. I furthermore promise and swear that I will not write, print, paint, stamp, stain, cut, carve, mark nor engrave them, nor cause the same to be done upon anything movable or immovable, capable of receiving the least impression of a word, syllable, letter or character, whereby the same may become legible or intelligible to any person under the canopy of heaven. All this I most solemnly and sincerely promise and swear, with a firm and steadfast resolution, to keep and perform the same without any equivocation, mental reservation or secret evasion of mind whatever, binding myself under a no less penalty than that of having my throat cut across, my tongue torn out by its roots and buried in the rough sands of the sea at low water mark, where the tide ebbs and flows twice in twenty-four hours, should I ever knowingly violate this my solemn obligation of an Entered Apprentice Mason. So help me God, and keep me steadfast in the due performance of the same. In token of your sincerity, you will detach your hands and kiss the Bible. "Brother Senior Deacon, you will release the brother from the cable-tow, he is bound to us by an obligation,-a tie stronger than human hands can impose." The Senior Deacon removes the rope from around the candidate's neck, and throws it aside. The Master steps back a few paces, and addresses the candidate. Worshipful Master: Brother ___, in your present condition, what do you most desire? Worshipful Master: Brother Senior Deacon and brethren, you will assist me in bring this brother from darkness to light. The candidate is now kneeling at the altar. All the brethren assemble around the altar, and place themselves in two rows, extending from the altar towards the East, the Stewards with their rods standing one at the end of each row, and having their rods crossed over the Master's head. 'Let there be light,' and there is light." The blindfold is instantly snatched by the Senior Deacon from the candidates eyes, and the Master, and all the brethren make the due-guard of an Entered Apprentice. There is a short pause. All drop their hands. And the Master concludes. "My brother, upon being brought to light in this degree, you discover the THREE GREAT LIGHTS in Masonry, by the assistance of the three lesser. The three great lights in Masonry are the HOLY BIBLE, SQUARE, and COMPASS. The Bible is given as the rule and guide of our faith; the Square to square our actions; and the Compass to circumscribe and keep us within due bound. The three lesser lights are three burning tapers, placed in a triangular form, representing the sun, moon, and Master of the Lodge, and are thus explained: As the sun rules the day, and the moon governs the night, so should the Worshipful Master endeavor to rule and govern his Lodge with equal regularity." "In token of friendship and brotherly love, I present you might right hand, and with the grip and word of an Entered Apprentice; but as you are uninstructed, I will explain them with Brother Senior Deacon." Worshipful Master: (Taking candidate by right hand): Brother Senior Deacon, I hail. Senior Deacon: All the secrets of Masons in Masonry, to which this token alludes. At the word "token" the Senior Deacon imparts the secret grip to the candidate. Worshipful Master: What is this? Worshipful Master: Has it a name? Worshipful Master: Will you give it to me? Senior Deacon: I did not so receive it, neither will I so impart it. Worshipful Master: How will you dispose of it? Senior Deacon: I will letter and halve it with you. Worshipful Master: Letter and begin. Senior Deacon: No you begin. Worshipful Master: You must begin. Senior Deacon: O.Worshipful Master: BO. "The grip is right. The word is right. You will now arise and salute the Junior and Senior Wardens as an Entered Apprentice." The candidate is presented by the Worshipful Master with a white leather apron. He is told that this is an emblem of innocence, and the badge of a Mason. He is also told that at the building of King Solomon's Temple there were three principal classes of workmen, each of whom, as a distinctive badge, wore their aprons in a particular manner, and this manner is described to him. The Worshipful Master say since he is now clothed as an Entered Apprentice, he is also entitled to his working tools. These are the twenty-four inch gauge (rule), and the common gavel. The Master, presents these to the candidate. He says - the twenty-four inch gauge is an instrument made use of by operative Masons to measure and lay out their work; but we, as Free and Accepted Masons, are taught to make use of it for the more noble and glorious purpose of dividing our time. The division of twenty-four equal parts, is emblematic of the twenty-four hours of the day. We are taught to divide these into three equal parts - eight hours for the service of God, and a distressed worthy brother; eight for our vocation, and eight for refreshment and sleep. The common gavel is an instrument Masons use to break off rough and superfluous parts of stones, but Free and Accepted Masons are taught to use it for the more noble purpose of divesting their hearts and consciences of the vices and superfluities of life, thereby fitting their minds as living stones, for the spiritual building -the house not made with hands, eternal in the heavens. The Worshipful Master tells the initiate: You were placed in the North-East corner of the Lodge as the youngest Entered Apprentice, in operative Masonry, the first stone of a building is usually laid in the North-East corner; you were therefore there placed to receive your first instruction, whereon to build your future moral and Masonic edifice. I will now proceed to explain to you what constitutes a Lodge, its form, supports, covering, furniture, ornaments, lights, jewels; how situated, and to whom dedicated. A Lodge consists of a number of free and accepted Masons duly assembled with the Holy Bible, Square and Compass, and a Charter or Warrant empowering them to work. Covering: The covering of a Lodge is the clouded canopy, or starry decked heaven, where all good Masons hope at last, to arrive by the aid of a ladder called Jacob's Ladder having three principal rounds denominated faith, hope and charity, teaching faith in God, hope in immortality, and charity to all mankind. But the greatest of these is charity; for faith may be lost in sight, hope ends in fruition, but charity extends beyond the grave to the boundless realms of eternity. A Lodge has six jewels, three immovable and three movable. The immovable jewels are the Square, Level and Plumb. The Square teaches morality; the Level equality; and the Plumb rectitude of life, and are worn by the three principal officers of the Lodge, the Worshipful Master, Senior and Junior Warden. The movable jewels are the rough ashler, perfect ashler, and trestle-board. The rough ashler is a stone taken from the quarry in its rude and natural state. The perfect ashler is a stone, made ready by the hands of the workmen to be adjusted by the working tools of the Fellow Craft. The trestle-board is for the Master to draw his designs on. Lodges in ancient times were dedicated to King Solomon, he being our first Most excellent Grand Master, in modern times, to St. John, the Baptist, and St. John, the Evangelist-two eminent Christian patrons of Freemasonry; and since their time, there has been represented in every regular and well furnished Lodge a Certain Point within a Circle embroidered by two perpendicular parallel lines representing St. John, the Baptist, and St. John, the Evangelist. On the top of the Circle rests the Book of Holy Scriptures; the point represents an individual Brother, the Circle the boundary line of his duty. In going around this circle, we necessarily touch on the two parallel lines, as well as on the Book of Holy Scriptures; and while a Mason keeps himself circumscribed within their precepts it is impossible that he should materially err. My brother, you will hereafter make yourself known among Masons by certain signs, a token, a word, and the points of your entrance. The signs, token and word have already been explained to you. The points of your entrance are four, namely: the gutteral, pectoral, manual and pedal - and allude to the four cardinal virtues - Temperance, Fortitude, Prudence and Justice [this is followed by a description of each of the four cardinal virtues]. In every well-furnished Lodge there are two large pillars, from eight to ten and sometimes fifteen feet high, permanently fixed inside the "preparation room" door, one on each side, and about five or six feet from it. They represent the pillars at the entrance to the Temple of Solomon. After passing between the two pillars at the entrance and having them described to him, the candidate is conducted to a representation of a flight of winding stairs consisting of three (3), five (5), and seven (7) steps. The number three is described as alluding to the three degrees which every Master Mason confers, and also to the three principal officers of the Lodge, i.e. the Worshipful Master, Senior Warden, and Junior Warden. The Senior Deacon explains to the candidate the distinction between Operative and Speculative Masonry. That is, Operative Masonry deals with the actual art of building. Speculative Masonry is described as the art by which the Freemason learns to subdue the passions, act upon the square, keep a tongue of good report, maintain secrecy, and practice charity. The candidate is told their ancient brethren wrought in Operative and Speculative Masonry, but now they work in Speculative only. A point is a position without dimensions. A line is a figure of one capacity, namely length. A superficies is a figure of two dimensions, length and breadth. A solid is a figure of three dimension, namely, length, breadth, and thickness. The Worshipful Master pointing out that the impressive ceremonies of the second degree are calculated to inculcate upon the mind of the novitiate the importance of the study of the liberal arts and sciences, especially of the noble science of Geometry. The Worshipful Master calls the attention of the new Fellow Craft to the large golden letter G suspended from the ceiling above the Master's chair. This is the "G" found in the current compass-and-square badge of Freemasonry, and stands for Geometry. It is explained that the Fellow Craft degree is founded on the science of geometry, which is the central theme of the entire Masonic order. This science comprehends the universe, the movements of the planets, and the cycle of the seasons. Especially is geometry useful to man in the Masonic science of architecture, and it is the basis for the Masonic designation of the Supreme Being as the Great Architect of the Universe. The initiate is told that geometry is so important to Masonry that the two terms were once synonymous. The major part of the third degree concerns the legend of Hiram Abiff. This is acted out with the candidate for initiation in the role of Hiram Abiff. The death of Hiram Abiff was planned by 15 Fellow Crafts who wanted his Secret Word. Twelve recanted. Three persisted in their plan. Hiram Abiff was slain at High Twelve (midday) while the craft were called from labor to refreshment. It was his custom at that hour to enter the unfinished Holy of Holies of the temple, to draw his designs on the trestle-board. The three Fellow Crafts, aware of this, placed themselves at the South, West and East gates of the inner court of the temple and awaited his return. Hiram Abiff, about to retire at the South gate was accosted by the first ruffian, who thrice demanded of him the Secret Word. On his refusal the ruffian gave him a blow with the twenty-four-inch gauge across the throat. Hiram Abiff fled and attempted to pass out of the West gate where he was accosted by the second ruffian who thrice demanded of him the Secret Word. Upon his refusal this ruffian gave him a blow with a square across his breast. Hiram Abiff fled and attempted to escape by the East Gage where he was accosted by the third ruffian who thrice demanded of him the Secret Word. On his refusal this ruffian gave him a violent blow with a setting maul on his forehead which felled him dead on the spot. They then buried the body in the rubbish of the temple until Low Twelve (midnight), when they met and conveyed the body in a westerly direction from the temple to the brow of a hill West of Mount Moriah. There they had dug a grave due East and West, six feet perpendicular, and buried it. At the head of the grave they planted an acacia sprout to mark the place in case they needed to find it later, and made their escape. Hiram Abiff was found to be missing the following day because no designs were on the trestle-board. King Solomon at first supposed him to be indisposed, and ordered strict search to be made for him in the temple area. The search having been made King Solomon then fearing foul play ordered the several rolls of the workmen to be called. At roll-call three Fellow Crafts were found to be missing, namely, Jubela, Jubelo, and Jubelum, who from the similarity of their names were supposed to be brethren and men of Tyre. The twelve Fellow Crafts who had recanted from the murderous plan appear before King Solomon, acknowledging their premeditated guilt and most humbly imploring his pardon. King Solomon orders the twelve Fellow Crafts to divide into parties of three, and travel three East, three West, three North, and three South in search of the ruffians. While pursuing a westerly course they met a man told them he had seen three men seeking passage into Ethiopia, but not having King Solomon's pass they were turned back into the country. When this was reported to King Solomon, he ordered them to disguise themselves and travel as before with positive orders to find the ruffians. They pursued a westerly course a second time, and as they were returning after several days fruitless search, one brother being more weary than the others sat down at the brow of a hill west of Mount Moriah to rest. On arising he accidentally caught hold of an acacia, which easily coming loose aroused his curiosity. He called his comrades, and together they found evidence of a newly made grave. The body of Hiram Abiff was then found in a westerly course from the temple in a grave dug due East and West six feet perpendicular, on the brow of the hill where the weary brother had sat to rest. King Solomon then went to the site of the grave, and after the others had failed in attempts to raise the body He took the body by the strong grip of a Master Mason, or the 'Lion's Paw' and raised it. It was then conveyed back to the temple where it was buried with due form. The body of Hiram Abiff was buried three times: first in the rubbish of the temple; second, on the brow of a hill west of Mt. Moriah; and thirdly without the gates of the city, as near the unfinished "Holy of Holies" as Jewish law would permit. Masonic tradition says they erected to his memory a marble monument, consisting of a beautiful virgin weeping over a broken column; with a book open before her, and in her right hand a sprig of acacia, in her left an urn and Time behind her, standing unfolding her ringlets and counting her hair. In the ritual of the third degree initiation the candidate goes through all the details of the simulated murder of Hiram Abiff, himself playing the part, and then lies as if dead until raised by the strong grip of the 'Lion's Paw' of the Worshipful Master. The meaning of each is explained to the Initiate. "The earliest antiquity lies buried in silence and oblivion, excepting the remains we have of it in sacred writ. This silence was succeeded by poetical fables, and these, at length, by the writings we now enjoy; so that the concealed and secret learning of the ancients seems separated from the history and knowledge of the following ages by a veil, or partition-wall of fables, interposing between the thing that are lost and those that remain." "One of the latter school of the Grecians examineth this matter and is at a stand to think what should be in it, that men should love lies, where neither they make for pleasure, as with poets ; nor for advantage, as with the merchant ; but for the lies sake. But I cannot tell." Flegetanis the heathen saw with his own eyes in the constellations things he was shy to talk about, hidden mysteries." So, as background for information I will present later in this article, I will give a brief overview of some of this, without taking up too much space, or going into too much detail. Anyone interested in a more detailed account is invited to consult Robert Hewitt Brown's, "Stellar Theology and Masonic Astronomy". The sun is the most magnificent object in nature. In ancient system the sun was personified in various allegories. Many were absurd enough on the face, but given the allegorical key, many contained profound and astronomical truths. The key was kept secret by the priests and philosophers, and only imparted to those who were initiated into the Mysteries. The profane remained in darkness believing they worshipped a real Hercules or Jupiter who actually lived and performed the exploits of mythology. By these means the priests of Egypt, and other ancient nations, ruled the people with a despotic power. The fables of mythology disclosed to them grand scientific and esoteric truths. But only to them, or to initiates. The sun was portrayed in connection with the changes undergone by the sun during the different seasons of the year - therefore in connection with time. All ancient temples were originally dedicated to the worship of the sun and the other celestial orbs, whose circuit in the heavens each year were emblematically represented in the details of their construction and ornaments. The word "temple" is from tempus, time; and is therefore synonymous with time, or the year. The allegory of the sun is obvious throughout the symbolism of Freemasonry. The Lodge is oriented with entrance due East - the place of the rising sun. The three lights of Masonry are so situated in allusion to the sun which rising in the East, gains the meridian in the South, and disappears in the West. The Junior Warden stands in the South, the Senior Warden in the West, and the Master in the East because the sun rises in the East to open and govern the day, and sets in the West to close the day; while the sun in the South at mid-day admonishes the weary workman of his mid-day meal, and calls him from labor to refreshment. So the form, dimensions, lights, furniture, and principal officers of the Lodge all have reference to the sun. One feature seen by all Masons in the Lodge is the circle embordered by two parallel lines. They are told that this represents the two St. Johns - St. John the Baptist, and St. John the Evangelist. The meaning not divulged is the astronomical significance. The circle represents the ecliptic or annual path of the sun, while the point within the circle represents the earth around which the sun appears to annually revolve. The parallel lines are the tropics of Cancer, and Capricorn. The summer solstice occurs on the 21st of June, and winter solstice on the 21st of December. These are the solstitial points, always marked by two parallel lines as can be seen on any terrestrial globe or map. The two dates, are traditionally the respective birthdays of St. John the Baptist and St. John the Evangelist. When Christ says of John the Baptist, in the Gospels, "He is decrease while I will increase", the allusion is to the sun of the summer solstice who will decrease while the sun of the winter solstice (Christ) will increase. The legend of Hiram Abiff is encountered in many ancient solar myths. The sun is slain by the three autumnal signs Libra, Scorpio and Sagittarius which span September/October; October/November; and November/December. When the sun reaches the autumnal equinox the days and nights are equal. Thereafter the days decrease in length while the night increase. The sun declines throughout Libra, but emerges without serious injury. The attack of Scorpio is far more serious. And the attack of Sagittarius proves fatal, for when the sun leaves the third autumnal sign, on the 23rd of December, he lies dead at the winter solstice - the time of year when days are shortest and night are longest. After the sun is slain the body is said to be carried on a westerly course because as the sun continues his course in the zodiac, he appears to be carried west by the wintry signs. This seems to be done at night because, the sun then being invisible, his change of position is only discovered by the stars which precede his rise at daybreak. The body of the sun is symbolically buried beneath the 'rubbish' of the dead vegetation of summer-in the midst of which, however, yet blooms the hardy evergreen, emblematic of the vernal equinox, the time when the days will begin to be longer than the nights. According to the Egyptian legend of the death of Osiris, the goddess Isis ransacked the whole four quarters of the earth in search of his body, which she finally discovered by the aid of a certain plant or shrub and caused to be regularly buried with sacred rites and great honor. According to the legend of Hiram Abiff it was the twelve Fellow Crafts - emblematically the three Eastern, three Western, three Northern, and three Southern signs of the zodiac, who made the search for the body. It was somewhere among the twelve constellations that the lost sun was certainly to be found. On June 21, when the sun arrived at the summer solstice - the longest day of the year, the constellation Leo being but 30 degrees in advance of the sun-appears to lift the sun with his powerful paw up to the summit of the zodiacal arch. The emblem of the weeping virgin represents Virgo weeping over the death of the sun, slain by the wintry signs. Saturn, standing behind her, denotes that Time will heal her sorrows, and, when the year has completed its circuit, her lord the sun will rise from the grave of winter, and triumphing over all the powers of darkness, come again into her embrace. John Robinson presents persuasive arguments in his book, "Born in Blood" that Freemasonry was a mutual protection, secret society, begun by the Knights Templars after their suppression. Robinson distinguishes between aspects of Freemasonry ritual he thinks were originated by the Templars, and others added later. Interestingly it is in those Robinson thinks were added later that there is the major agreement with detailed features of Bacon's ideas. According to Robinson his book came about as the result of research into certain unexplained aspects of the Peasants' Revolt in England in 1381. There was evidence of an impressive organization behind the revolt. From this it was a short step to more specific evidence that pointed to Templar involvement. During the revolt upwards of a hundred thousand men marched on London. Their leader was Walter Tyler which seems to have been an assumed name. Tyler is the tradition name for the man who guards the Masonic lodge. Their concentrated and especially vicious attacks on the religious order of the Knights Hospitaller of St. John.. "Not only did the rebels seek out their properties for vandalism and fire," says Robinson, "but their prior was dragged from the Tower of London to have his head struck off and placed on London Bridge, to the delight of the cheering mob." The Knights Hospitaller were the great enemies of the Templars and the Templar properties were turned over to them after the Templars were suppressed. "Any fugitive Templar taken would be subjected to imprisonment and torture to extract confessions of heresy, and any person assisting him even with advice and counsel could be punished and excommunicated, risking the loss of any property he might have. Under those circumstances, the matter of who could be trusted was literally a matter of life and death. If to let a man know your name might put your life and property at stake, what kind of oath, or threat, would be sufficient to give a feeling of comfort? The fugitive Templar would have needed a rule such as that ancient Old Charge of Freemasonry, that a Mason tell no secret of any brother that might cause that brother to lose his life and property." "I most solemnly and sincerely promise and swear without the least hesitation, mental reservation, or self-evasion of mind in me whatever, binding myself under no less penalty than to have my left breast born open and my heart and vitals taken from thence and thrown over my left shoulder and carried into the valley of Jehosaphat, there to become a prey to wild beasts of the field and the will vultures of the air, if ever I should prove willfully guilty of violating any part of this my solemn oath or obligation of a Fellow Craft Mason." But if the Freemasons were merely a secret order begun by Medieval building guild such bloody oaths would make no sense at all. Robinson makes another significant point as regard the alienation of the Templars from the Church. He says that for a Templar the idea of the church as his enemy would have been both depressing and confusing. Formerly the Templar initiation had made the knight a monk whose entire life was thereafter pledged to the service of the church and the pope. Now he was an outcast from his religious allegiance. They would need a focal point of agreement, that there was indeed a God. Else how could they have effective oaths? This explains the feature that most characterizes the Fraternity, and has been without explanation for hundred of years - the central tenet of Freemasonry that each member must assert his belief in a Supreme Being, but that how he worships that Supreme Being may not be questioned. Masons who believe their fraternity was born in medieval guilds of stonemasons most explain how such guilds could have acquired an attitude toward religion and church that said, "If they matter to you, it's perfectly all right with us, but to our protective, secular brotherhood the sacraments don't matter. Christ doesn't matter. All that matters is you agree that there is indeed a Supreme Being over all of us." Robinson points to the Grand Hailing Sign of Distress of the Master Mason as one evidence of the antiquity of certain feature of Freemasonry. This sign, with both hands raised in the air, he says, gives away its age, because the hands are held exactly as they would be in response to a gunman's demand, "Hands up!" if such a gunman gave the command to someone getting out of a stagecoach. Such a sign as this, he says, paralleling that ordered by a criminal would not have been used by the Freemasons if it had existed at the time it was implemented. Therefore the Grand Hailing Sign of Distress must have implemented prior to that time. Still another was that the visiting brother be given 'employment' for two weeks, then given some money and put on the road to the next lodge. We should medieval guilds of master craftsmen have made a practice of hiring men they didn't need and bestowing money on itinerant stonemasons passing through? That kind of treatment is much more likely to be extended to a man on the run, who would be given lodging for up to two weeks, not 'employment.' Another interesting Old Charge is that no Mason should engage in sexual congress with the wife, daughter, mother, or sister of a brother Mason. The charge has been used by anti-Masons to show that Masons had selective morality, because their moral code was limited to their own members, allowing the brothers to have sexual relations with the wife, daughter, mother, or sister of any non-Mason. Their mistake is seeing the charge as part of any code of morality, which it is not. This brotherhood was a secret organization that somehow included men being, or aiding and abetting, heretics and traitors. It was vital that they stick together." He says the collective evidence indicates Freemasonry was essentially a mutual protection society of men at odds with church or state, or both, and not a building society. Robinson refers the origin of the chessboard floor of the Masonic Lodge to the Beau Seant, the battle banner of the Knights Templar. This was a vertical design consisting of a black block above and a white block below. The black block signified the black world of sin the Templar had left behind, and the white block symbolized the pure life he had adopted as a soldier for Christ. Robinson thinks that originally the Masonic Lodges had only one black and one white square. He says another mystery that finds a solution in the Templars is the "clothing" of Freemasonry. The primary item is the Masonic apron, the first item received by the Entered Apprentice at his initiation and the First Masonic symbol explained to him. Today that apron has come to be lined, trimmed, fringed, and decorated with badges and symbols, but in ancient Masonry it was an untrimmed white lambskin tied around the waist. This lambskin has been proclaimed as a badge of innocence and purity. This apron is a direct tie to the Templars. Their Rule forbade any personal decoration except sheepskin, and required that the Templar wear a sheepskin girdle about his waist at all times as a reminder of his vow of chastity, a context within which purity and innocence are vital. The other item of Masonic clothing, the gloves, was not an article of common clothing in the Middle Ages, and possession might well have aroused suspicion, or at least drawn attention to the wearers, for which all secret societies hold a strong aversion. Moreover, gloves were not easy to make and were expensive, so they were generally worn only by the knightly class and higher clergy. However, there was a strong Templar connection. Their Rule required the Templar priest to wear gloves at all times to keep their hands clean "for when they touch God" in serving Holy Communion. "Finally, was it just pure coincidence that the Knights Templar and the Freemasons were the only organization in all of history that found their principal identification in the Temple of Solomon, or was that history trying to tell us something?" "Then came a time near the beginning of the seventeenth century when science and mathematics began to take hold of men's minds, to stir their imaginations, and to invoke new theories, new experiments." and he thinks this was when the emphasis on learning was added onto the Masonic ceremony. He thinks the checkerboard floor patterns of black and white squares was a later addition to the Masonic symbolism, amended from the one black and white square of the Beau Seant. He notes that while the Masonic oaths are taken on the compass and square that rests on the top of a Holy Bible, these Bibles were not available to individuals in the Middle Ages indicating the oaths were formerly taken on some symbol. He says this symbol may have been the compass and square alone at one time, but notes that if the earliest Masons were indeed fugitive Templars there symbol might well have been the Seal or "Star" of David. This symbols consists of two interlocking equilateral triangle, one upright, and the other inverted, with the upright triangle merely an outline. If the crossbar on the horizontal bars are left out, Robinson says, suddenly we see the compass and square, and only minor modifications are required to give the new symbol the surface appearance of these tools. the best preservative to keep the mind in health is the faithful admonition of friends." But all these things are graceful in a friend's mouth, which are blushing in a man's own." "'We of this island of Bensalem,' (for so they call it in their language) 'have this; that by means of our solitary situation; and of the laws of secrecy, which we have for our travelers, and our rare admission of strangers; we know well most parts of the habitable world, and are ourselves unknown.'" But the records write it as it is spoken. So I take it to be a denominate of the king of the Hebrews, which is famous to you, and no stranger to us." "'But thus you see we maintain a trade not for gold, silver or jewels; nor for silks; nor for spices; nor of any other commodity of matter; but only for God's first creature, which was Light.'" As a sidelight on religion in the mystic kingdom, Bacon cites that Jews live on the island, that they are free to practice their religion without being forces to convert, and that they in return "give unto our Savior many high attributes." He learns of this from a Jewish merchant named Joabin, whose name Bacon seems to have concocted from Jachin and Boaz, the names of the pillars that flanked the entrance to Solomon's Temple, names that also have been applied to secret Masonic hand grips. All of which leads to the firm conclusion that Freemasonry was there, mingling with the likes of Drake, Hawkins, and Raleigh at the court of Elizabeth I, and thwarting, both secretly and publicly, the Catholic ambitions of the Jesuits and of Philip of Spain to return England to the authority of the Roman church." Many books were written during Bacon's time about the London Criminal Underworld. Some of these were Thomas Harman's "A Caveat or Warening for Commen Cursetors" (1567); Robert Greene's "Notable Discovery of Coosenage (1592); and Thomas Dekker's "The Belman of London (1608). But another London Underworld was not so well covered by the writers of the time. This was the London Underworld of Hidden Knowledge. Templar Knowledge was not the only Hidden knowledge present in London and in England during Bacon's time. The age was a hotbed of underground activity in this knowledge. "The Temple and the Lodge" by Michael Baigent and Richard Leigh describes the routes by which hidden knowledge came to England. First Islamic ideas penetrated Europe from Spain. During the seventh and eighth centuries Islam overwhelmed the Iberian peninsula and advanced into France. Principles of sacred geometry and architecture filtered northwards from Spain and France. During the seven and a half centuries between the Battle of Poitiers and the reign of Ferdinand and Isabelle, Spain was a veritable repository of 'esoteric' teaching. The Majorcan Raymond Lull, or Lully The first major 'esotericist' in Western tradition was whose work exerted an enormous influence on later European developments including Francis Bacon who appropriated the idea of his "Ladder of the Intellect" and his discovery device from Lully. But even apart from Lully it was accepted that individuals seeking 'esoteric' or mystical initiation had to make a statutory pilgrimage to Spain. "Not satisfied with the judgment and reach of common sense, with his eye passing to and fro through all nature, he pressed into thinner-most penetralia of causes; and by that token, led by God, with Dee as teacher, and with Dyer as companion, he learned chemistry, that starry science, rival to nature." The researches of Joy Hancox throws light on major underground esoteric activity in England during Bacon's time. In August of 1965 Joy Hancox purchased a house in Salford. She discovered a secret flight of stone step disappearing into a brick wall under the floorboard at the back of the house. Intrigued with the clandestine activities associated with the house at an earlier period in it's history she began a systematic investigation into the history of the house and the surrounding area. Her search eventually led to an amazing collection (that came into her possession in June of 1984) of hundreds of pieces of card and paper covered with esoteric geometrical drawings of mathematical precision, all exquisitely constructed, that had been owned at one time by John Byrom (1691-1763). John Byrom was a man of complex personality and brilliant mind who was a member of the Royal Society at the time Isaac Newton was president of the society. Byrom was acquainted with many of the leading figures associated with the Royal Society during his time. He was also a Freemason, as were many of the members of the Royal Society at that time. He was active in Freemasonry and other secret organizations at the time Freemasonry first went public, and the drawings seem to have been material that pertained to secret Masonic traditions.. Hancox cites evidence the drawings were displayed for study in a secret room by members of a secret inner group of the Royal Society. As Hancox consulted specialists in various areas of arcane knowledge, in addition to pursuing leads provided by names annotated on some of the drawing, she discovered strong evidence of Masonic and Rosicrucian associations. After examining the drawings, Neville Barker Cryer, senior freemason and Secretary of the Quatuor Coronati Lodge - the Research Lodge of Freemason, concluded some of them were part of a lost tradition pertaining to the origin of Freemasonry in England. After viewing the drawing, Adam McLean, a noted expert on Alchemic and Hermetic lore, recognized some of the drawings as being paralleled by illustrations in a major Rosicrucian works published by a German writer, Theophilus Schweighardt in 1618. And here the research took a very interesting turn. Some of the demonstrations of sacred geometry in the drawings proved to be plans for various theaters during Shakespeare's time - including the Globe theater. This led straight to the heart of the esoteric underground activity taking place at that time. The drawings were a unique collection of esoteric source material, dealing in the main with Sacred Geometry, beginning in the reign of Elizabeth I and ending in that of George II, some 174 years later. Hancox published the result of her search in 1992 in a book titled, "The Byrom Collection". Her book opens a window onto activity related to an underground network of hidden knowledge that flourished in England during the Dee/Bacon period. Although some of the names annotated on the drawings, were from different periods, many were of people from Bacon's time, and these, plus related research by Hancox, points to a network of people associated in the underground hidden knowledge in Bacon's time. Some individuals either on the drawings, or closely associated with those whose names were on the drawings were: John Dee, Robert Dudley (Earl of Leicester), Theodore de Bry, Philip Sidney, Mary Sidney, Henry Herbert and other members of the Herbert family, Michel Le Blon, Gerard Thibault, Giordano Bruno, Francis Bacon, Sir Walter Raleigh, Robert Fludd, and Michael Maier. For one example, Hancox cites the words "Blon fecit" (Blon made) inscribed on the back of one of the drawings. This proved upon further research, to be the work of Michel Le Blon (1587-1658). The Le Blons were one branch of a large influential group of families whose activities as engravers, artists and publishers spanned several generations. The founder of this remarkable dynasty was Theodore de Bry (1528-1598), who was also connected with some of the drawings. Michel spent his childhood in Frankfurt, the home of Theodore de Bry, but moved in his youth to Amsterdam, where he rapidly acquired a fine reputation as a goldsmith, silversmith and engraver, and for fifty years was a leading figure in artistic circles in Amsterdam and beyond. Hancox found most of the features of another drawing in an illustration of the work of Thibault titled, The Academy of the Sword. L'Academie de L'Espee by Gerard Thibault first appeared in Leyden in 1628. It was an elaborate treatise on swordsmanship based on a highly complicated set of mathematical rules. Bacon was well acquainted with the man and his work. In one of his many veiled depictions in the "Shakespeare" plays of contemporary people and events with which he was associated, Bacon had in Romeo and Juliet a major character is named Tybalt, in connection with a reference to fencing "by the book of arithmetic". Michel Le Blon became an important art dealer. His most important English patron next to the Duke of Buckingham, the arrogant favorite of James I, was Thomas Howard, Earl of Arundel (a friend of Francis Bacon. In fact, according to historic accounts Bacon died in his house). Other drawings in the collection were connected with De Bry. Theodore De Bry was a Huguenot, branded as a heretic and forced to flee his native city of Liege, who, with so many other Huguenot tradesmen, came to London. Hancock found evidence of his connection with the Elizabethan Theatres and with important personalities of the day such as Robert Dudley, Earl of Leicester (who had his own connection with the theatre companies) and Sir Walter Raleigh and his circle. In 1587 de Bry engraved the thirty-four plates for Sir Philip Sidney's elaborate funeral and when Thomas Hariot (one of the principals in Raleigh's circle) published his account of "The Briefe and True Reporte of the new found land of Virginia" while de Bry was still in London, upon his return to Frankfurt de Bry produced a magnificently illustrated edition with his own engravings based on John White's watercolors. De Bry later published the major Rosicrucian related works of Robert Fludd and Michael Maier. The huge tomes of Robert Fludd's "History of the Macrocosm and the Microcosm" were published by de Bry at Oppenheim in 1617, 1618, and 1619. Michael Maier's, "Atalanta Fugiens" was published by de Bry at Oppenheim in 1618. All of this touches very close on the hidden figure of Francis Bacon, and is additional evidence of his intimate association with Freemasonry. Francis Bacon must have been close to both Dee and Leicester at one time. Leicester is reputed by Baconians to have been Bacon's father. The evidence that Bacon used the mask of Spenser places him close to Leicester since Spenser was at one time secretary to Leicester. Bacon was closely involved in the Sidney circle and Sidney was close to both Dee and to Leicester - whose sister was his mother. In addition, if Bacon's authorship of the Shakespeare plays is accepted as a premise, the Globe Theatre where the plays were shown was almost certainly the design of Bacon since one of Bacon's major ideas was the Intellectual Globe which was a replica in miniature of the great globe - the earth, and the Globe Theatre was built on the identical concept. After the Globe Theatre burned down Ben Jonson remarked, "See the world in ruins." Inexplicably, along with the other esoteric material in the drawings relating to Sacred Geometry and to the mysticism of inner Masonic and Rosicrucian traditions, were at least ten drawings of compass cards engraved by various instrument-makers. 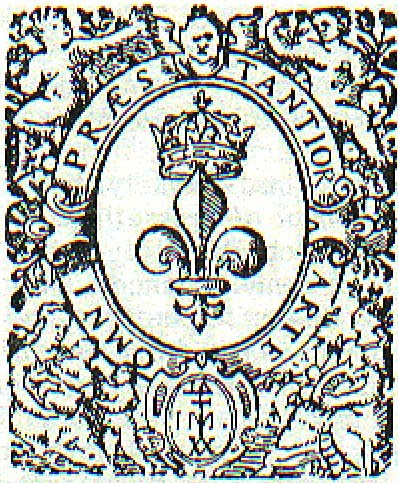 The north was indicated by the traditional prominent fleur-de-lys, but there were additional elements recalling the iconography employed by Michel Le Blon in his two engravings for Thibault. Even more intriguing was the manner of highlighting a further sixteen by-points around the card. Also there were compass cards inset with the seven figures symbolizing the seven divisions of learning. In the seventh century, and for a long time afterwards, the circle of learning to which all the most distinguished scholars was confined, was limited to what was then called the liberal arts and sciences, and consisted of two branches, the trivium and quadrivium. The trivium included grammar, rhetoric, and logic. The quadrivium included arithmetic, geometry, music, and astronomy. The seven liberal arts and sciences played a major role in Masonic ceremonies, but what was the logic behind including them on the compass card? What connection did they have with compass cards? And what was all of this material on compass cards doing mixed in with esoteric material relating to Freemasonry and the Rosicrucians? This has an important bearing on the whole subject, and there is a very interesting explanation for this, which I will give later. This seems an appropriate place to connect a few dots. The Byrom Collection demonstrates Masonic and Rosicrucian associations among the group of people with whom Francis Bacon was connected. 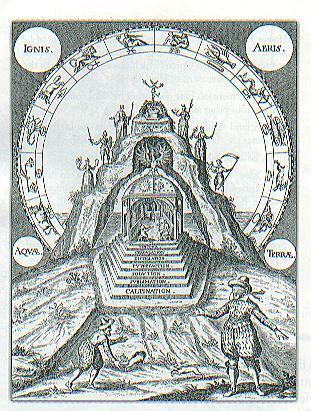 Bacon's model of the universe is closely related to The Temple of Solomon of Freemasonry. Robinson shows Bacon's ideas have a close agreement with those of Freemasonry, and the elements Robinson points to as having been added to the Masonic rituals subsequent to its formation by the Templars are precisely those elements associated with the Advancement of Learning that would relate to Bacon's ideas. Symbolic title pages of Bacon's works published during his lifetime indicates a close association of Francis Bacon with Freemasonry. Significantly the two obelisks on Bacon's "De Augmentis" indicate the division of the six parts of his Great Instauration into three revealed parts, and three conceals parts. The initial three "revealed" parts (for which Bacon left works) are shown in the three books at the base of the "light" pillar related to the sun. While the other three "concealed" parts are shown in the three books at the base of the "dark" pillar connected with the moon. 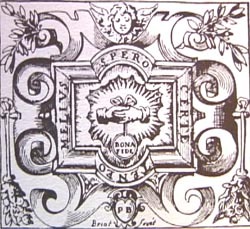 Beyond this, symbolism on the title page of the 1624 edition of Bacon's "De Augmentis" indicates Bacon was either a concealed king, or king of the Freemasons, or both.. In "Bacon-Masonry" George Tudhope points out that while there is absolutely no evidence to indicate Freemasonry came from the Lodge of the Holy Saint John at Jerusalem, there is evidence to connect it with a lodge not at, but of Saint John at Jerusalem. It is known, points out Tudhope (and also Fuller in her biography "Sir Francis Bacon") that Bacon held a lease on Canonbury Tower from 1616 to 1625, and this was in a complex of buildings known as the Priory of St. John of Jerusalem. If the evidence for Bacon's authorship of the Shakespeare plays is accepted, a wide field of very strong evidence for Bacon's connection with Freemasonry is opened up, so my next step is to examine some of this evidence. L Lord how wise you are? I I will tell thee wonders. S So I heard you say. F Fair weather after you. As Dodd says, the body of evidence cited in his book "proves incontestably these works were saturated in Masonry." The problem is, and has always been, dual. In the first place scholars do not realize that Bacon wrote the plays. And in the second place, in addition to this lamentable ignorance, the scholars who have studied the plays have had no familiarity with Freemasonry. When they encounter something, such as the knocking at the gate scene with the porter in Macbeth, it registers no more than light on the eyes of a blind man. But the repeated three knocks at the door, especially in connection with the association of King James with Scottish Freemasonry, almost certainly alludes to the ritual of Freemasonry. But enough of this scattered and sporadic evidence. What I want to do now is to provide an overview of the Masonic matter in The Tempest. "The form of a Masonic lodge is said to be a parallelogram, or oblong square; it greatest length being from east to west, its breath from north to south. A square, a circle, a triangle, or any other form but that of an oblong square, would be eminently incorrect and unmasonic, because such a figure would not be an expression of the symbolic idea which is intended to be conveyed. Now, as the world is a globe, or, to speak more accurately, an oblate spheroid, the attempt to make an oblong square its symbol would seem, at first view, to present insuperable difficulties. But the system of Masonic symbolism has stood the test of too long an experience to be easily found at fault; and therefore this very symbol furnishes a striking evidence of the antiquity of the order. At the Solomonic era -the era of the building of the temple at Jerusalem - the world, it must be remembered, was supposed to have that very oblong form, which has been here symbolized. 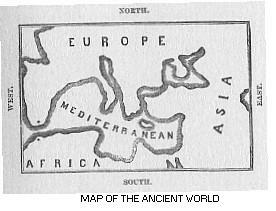 If, for example, on a map of the world we should inscribe an oblong figure whose boundary lines would circumscribe and include just that portion which was known to be inhabited in the days of Solomon, these lines, running a short distance north and south of the Mediterranean Sea, and extending from Spain in the west to Asia Minor in the east, would form an oblong square, including the southern shore of Europe, the Northern shore of Africa, and the western district of Asia, the length of the parallelogram being about sixty degrees from east to west, and its breath being about twenty degrees from north to south. This oblong square, thus enclosing the whole of what was then supposed to be the habitable globe, would precisely represent what is symbolically said to be the from of the lodge, while the Pillars of Hercules in the west, on each side of the straits of Gades or Gibraltar, might appropriately be referred to the two pillars that stood at the porch of the temple. A Masonic lodge is, therefore a symbol of the world. This symbol is sometimes, by a very usual figure of speech, extended, in its application, and the world and the universe are made synonymous, when the lodge becomes, of course, a symbol of the universe." So we have the action taking place in a Masonic Lodge, complete with the two pillars at the entrance. Is this far fetched? Let's go a step further. The floor of a Masonic Lodge is composed of black and white squares like those on a chessboard. In my essay "Bacon-101-6", I demonstrated the symbolization of The Tempest is that of a chess game, built on the scenario of Ferdinand and Miranda playing a game of chess, and that realization of this symbolism brings the realization that all of the action takes place on the black and white squares of the chessboard. Thus the floor where the action takes place, is made up of black and white squares. Therefore, we add to the symbolic setting in the Masonic Lodge, the chessboard - black and white square design - for the floor of the setting. This is exactly the floor of the Masonic Lodge. So we not only have the Masonic Lodge; we not only have the twin pillars at the entrance; we also have the chessboard floor of the Masonic Lodge. In "Secrets of the Shakespeare Plays" I described the fact that, among other features, the characters in The Tempest are modeled on the signs of the zodiac. While searching the web I came across a page with an interesting graphic from a work by a Spanish Jesuit who lived at the time of Bacon. His name was Juan Bautista Villalpando. He was obsessed with the idea of reconstructing The Temple of Solomon. In his depiction of Solomon's Temple he showed the astrological symbols of the zodiac arranged around the outline of The Temple of Solomon just as Simon had the astrological signs of the zodiac arranged around the outline of the chessboard on his chessboard of Europe. Was all of this coincidence? If this was the only Masonic symbolism in the play, coincidence might be a possibility (although very unlikely), but this is not all by far. Detail is piled upon detail. The message obviously tells us Two Sons Of Widow are hid here. We have seen that in the third degree, the degree of the Master Mason, the initiate becomes Hiram Abiff, the Son of a Widow. That is, both Bacon and Tobie Mathew were Master Masons. So the "sit the dial at" message is addressed to Freemasons. See also the graphic in my article "The Authorship Question and Beyond" from the 1577 book of Alciat's Emblem published in France while Francis was there, and later published in Whitney's Choice of Emblems in England in 1586. In this emblem we see a SOW (Son Of Widow) rooting on the ground. In the background, to the right, are the initials "FB" for Francis Bacon. The pyramid of nature with the light and dark "A's" is in the center, while to the back at the left are the pillars of Hercules which also equate with the pillars of Jachin and Boaz at the entrance to Solomon's Temple, and to Masonic lodges. Is it coincidence also that. at an early point in the play, Antonio says, "This wide-chopped rascal-would thou mightst lie drowning the washing of ten tides", paralleling the vow of the candidate who agrees in his rite of secrecy in the Masonic initiation "to be buried in the rough sands of the sea at low water mark, where the tide ebbs and flows twice in twenty-four hours", should he ever knowingly violate his solemn obligation? And is it coincidence Caliban says to Stephano and Trinculo, "Be patient, for the prize I'll bring you to shall hoodwink this mischance", alluding to the blindfold fastened over the candidate's eyes, in each of these three Masonic initiations - called a "hoodwink" by the Masons? Than bees that made 'em." teach me how to name the bigger light and how the less that burn by Day and Night." Senior Deacon: I will syllable it with you. Senior Deacon: No, you begin. Worshipful Master: The pass is right. There is even a reference to the one slipper the candidate wears during the initiation. Antonio: If it were a kibe 'twould put me to my SLIPPER. The drama time line in the play goes from Sycorax to Prospero. Sycorax is darkness. Prospero is light. Initiation into Freemasonry always moves from darkness to light. Remember the phrase of the Initiation: "Mr. ___, who has been in darkness and now seeks to be brought to light". Mackey says the great motto of the order is, "Lux e tenebris" - Light out of darkness. In my articles on "Don Quixote" I have shown that Cervantes was one of Bacon's masks. 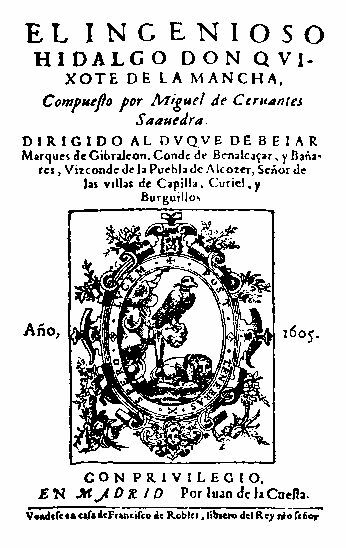 On the Cervantes crest on the title page of the 1605 edition of Don Quixote that was published in Madrid Spain appears the motto, "post tenebras spero lucum", i.e. "after darkness I hope for light." And for emphasis Bacon has Don Quixote repeat this in Part II of Don Quixote where he says to Sancho Panza, "post tenebras spero lucum". From beginning to end Masonic ceremony is under the direction of the Worshipful Master. The Tempest begins with the word MASTER. And it is certainly no accident that it ends with the word FREE , "Let your indulgence set me free." That wrings my eyes to it. Is it a coincidence? Or is it a HINT? Personally, I go with Miranda. "The King's son have I landed by himself. Q. How were you then disposed of? So we see the candidate is, in fact, placed in an "odd angle" of the Lodge. "A South-West blow on ye"
A South-West wind comes from the South-West and blow toward the North-East. This implies the location of the one on whom it blows is in the North-East. In the lecture on the first degree - the Entered Apprentice the Worshipful Master tells the Initiate that the four points of entrance allude to the four cardinal virtues - Temperance, Fortitude, Prudence, and Justice. Then he gives a description of these four cardinal virtues to the Initiate. Is it coincidence that precisely these four virtues are delineated in the play - two in regards to Ferdinand and Miranda - and two in regards to Prospero? Ferdinand must exhibit fortitude in enduring the trials that Prospero subjects him to. Both Ferdinand and Miranda are required to exercise temperance and control their passions until after the marriage has taken place. Prospero administers justice to the evil doers from the king's group, and throughout the play Prospero exhibits the virtue of Prudence. This has even been the subject of more than one essay. Douglas L. Peterson in "Time Tide and Tempest" finds that Prospero is a conscious depiction of the virtue of Prudence as it was traditionally depicted at that time in writings such as "The French Academy" of Primaudaye, and "The Arte of Rhetorique" by Thomas Wilson. He says the most significant trait of the prudent man was he has learned to use time, and knows when as well as how to act. He shows how throughout the play Prospero is depicted in curiously detailed descriptions as making a wise use of time. During the drama the King's party, in their wandering, make a circle around the island. This suggests the rite of circumambulation that takes place in all three degrees of the blue lodge. But the depiction of the rite of circumambulation in the play is much more precise than this. The word "AT" in the message, "set the dial at NBW, F Bacon, Tobey." is in the 32nd speech in the play. Implicit in this message is the idea that each speech correlates with a compass direction, and that this marks the end of a clockwise circuit of the compass that began with North and proceeded all the way around the compass, passing East, South, and West along the way to end at NBW. This corresponds exactly to the circumambulation ritual in Freemasonry that begins at NORTH and proceeds clockwise around all the points of the compass passing the stations of the Masonic officers at East, South, and West along the way. The Tempest in relation to the First Folio is part of an integral schema designed to reflect a model of both the universe and the world. Ancient people had a closer contact with nature and the changes of the annual cycle. For ancient people time was the index of the macrocosm. Both Temple and Tempest derive from Latin roots denoting time. In Masonic ritual the rite of circumambulation denoted the movement of the sun in its annual circuit around the zodiac, around the central position of the earth, and around the temple that was the miniature model of this grand design. The Temple of Solomon, and the Masonic Lodge as a reflection of The Temple of Solomon, were models in miniature of both the universe and the world. This is clearly seen in the design of The Tempest in relation to the First Folio. The First Folio was composed of 36 plays. One of these was omitted from the catalogue of plays so the symbolism would not be too apparent. In the First Folio one of three symbolic headpieces appeared at the beginning of each play. One headpiece was made up of what appeared to be seven Masonic squares. Another was made up of a pattern of lily work suggesting the "lily work" on the two famous pillars - Boaz and Jachin. The third had a bowl on each side with a flower, suggesting the bowl with the lotus at the top of the two pillars. These headpieces were sequenced throughout the plays repeating all three with each sequence of three plays. As is well known each sign of the zodiac is divided into three parts of 10 degrees each. These are called decans, and there are a total of 36 decans. The distribution of the three ornamental headpieces through out the 36 plays of the First Folio represent the 36 decans distributed through the 12 signs of the zodiac. Some of the plays are clearly associated with a specific sign of the zodiac. This indicates The Tempest is the microcosmic temple, just as the Temple of Solomon and the Masonic Lodge, surrounded by the circle of the zodiac. In my essay "Secrets of the First Folio" I demonstrated the various plays represent various times during the annual cycle. At the same time the plays in the First Folio are designed to indicate the number 32 in connection with all points of the compass reflecting the world. One play is omitted from the catalogue of plays. If the remaining plays are counted with plays of more than one part counted as one play the count is 32 plays. The rite of circumambulation also denotes a circuit of the compass since the candidates moves in a circle around the directions of the compass. This reflects all directions of the world and reflects a microcosm of the world in the lodge. We must remember this esoteric doctrine comes from the Knights Templar, those master mystics, who were connected with the Grail legends. Gareth Knight points out in "The Secret Tradition in Arthurian Legend" that the Round Table had its prototype in the night skies, and was thus a microcosm of the universe. For it was the image on earth of the zodiac. What has been well described as the 'starry" wisdom, i.e. the knowledge embodied in those ancient images fashioned by ancient mystics onto the tilt of the earth and the plane of its orbit round the Sun - the broad belt of constellation that circles the earth. Bacon had drank deep of the ancient stream of mystic wisdom, and the hieroglyphics of the "Starry Science" are enshrined throughout his deathless plays. Consider the play of "Romeo and Juliet" for example. Early in the play the nurse says it is a fortnight (14) days until the birthday of Juliet who was born on Lammas eve. Lammas was August 1. So Juliet was born on the night of July 31. As the date approaches we are introduced to the character Tybalt who is called, "King of Cats". King of Cats would be the sign of Leo the Lion. On July 28th the sun is in conjunction with Regulus, the giant red star at the heart of the constellation of Leo. Jachin and Boaz were each 18 cubits in height and had capstones of either 4 or 5 cubits. On July 28th the sun would have been at a height of 45 degrees, and the shadows cast to the east and west by the two pillars on this day would have been the same as their height on the days when the sun was conjunct with Regulus. In view of the highly esoteric nature of the drawings in the "Byrom Collection" many of which related to this period when the plays were written, we must believe that there were Freemasons addressed by Bacon and Mathew in the opening message in The Tempest, adepts in the hidden knowledge, who could read these hieroglyphics of the "Starry Science" written throughout the First Folio. The great secret of the design of the First Folio is the secret of Bacon's contest with the ancients. "For if I profess that I, going the same road as the ancients, have something better to produce, there must needs have been some comparison of rivalry between us (not to be avoided by any art of words) in respect of excellency or ability of wit, and though in this there would be nothing unlawful or new (for if there be anything misapprehended by them, or falsely laid down, why may not I, using a liberty common to all, take exception to it?) yet the contest, however just and allowable, would have been an unequal one perhaps in respect of the measure of my own power." Bacon designed the individual plays with one face looking toward the past, and one looking toward the future to show the comparison between the knowledge of the ancients and his Discovery Device. For the overall schema of the First Folio, he built in the 32 directions of his Intellectual Compass he used in his Discovery Device as contrasted with the 36 divisions of the decans of the zodiac, i.e. the overall design pits his Discovery Device against the "Starry Science" - the piece de resistance of the Ancients. The division of 32 deals with a model of the world. The division of 36 deals with a model of the universe. "The Carthagians were indebted to the Tyreans for their origins, manners, :language, customs, laws, usages"
Adrian: Tunis was never graced before with such a paragon to their queen. Gonzalo: Not since widow Dido's time. Antonio: Widow? A pox o' that! How came that "widow" in? Widow Dido! Sebastian: What if he had said "widower Aeneas" too? Good Lord, how you take it. Adrian: "Widow Dido," said you? You make me study of that. She was of Carthage, not of Tunis. Gonzalo: This Tunis, sir, was Carthage. Sebastian: Bate, I beseech you, widow Dido. Antonio: O, widow Dido? Ay, widow Dido. With the reference to Aeneas this passage also contains an allusion to the Mysteries. Aeneas left Tunis or Carthage on a voyage to Cumae (a harbour in Naples) and here he made his descent in Hades, an episode that since Warburton as been recognized as a veiled account of his initiation into the Mysteries. I have demonstrated in my previous articles that The Tempest is modeled on the Mysteries, and this has been demonstrated in much more detail by Colin Still in his book, "Shakespeare's Mystery Play". That the rituals of the Blue Lodge are modeled on the Mysteries has been demonstrated repeatedly by Masonic writers. So the incorporation of the Mystery allegory in The Tempest is one of the many connections with Masonry. Trinculo: We steal by Line and Level. Steal by 'Line and Level' is another excellent passe of pate. There is another Garment for it. This is emphasized by Stephano's remark - an excellent witticism - another garment for it. With gold on lasting pillars." Suggesting in one sentence the famous pillars at the entrance to the Temple of Solomon, and at the entrance to the Masonic Lodge, plus the obelisks on which events were recorded in engravings, and from which the temple pillars were derived. "Tis a custom with him in the afternoon to sleep; then thou mayst brain him, having first seized his books, or with a log batter his skull.."
and struck him a violent blow on the forehead." There are the three Fellows of a determined and atrocious characters in the Ritual story. There are the three "Men of Sin" in The Tempest. Both principals were "Masters". Both were to be brained. Both were to be murdered on their retirement. Both to meet their death after high twelve. Both were to die by a wooden weapon. One by a log, the other by its wooden equivalent in the Lodge. Both the Ritual and the play used identically the same word "custom" to describe the habit of both Masters; and it is placed in the forefront of the story in both cases. If he were that which now he's like - that's dead;"
But he goes beyond this still. For in the Masonic ritual the initiate who is in the state of simulated death is raised from that state with the aid of the Worshipful Master by the "Strong grip of the Lion's paw". And in The Tempest the sleeping Alonso is raised by Ariel whose name means "Lion of God". That is, Prospero will give a discourse just as the Worshipful Master does at the end of the Masonic Initiation, and will explain the meaning of the events. "One of the early customs practiced by the fraternity at the beginning of the Eighteenth Century and which illustrates the crudeness of that period, is shown in what was called drawing the lodge. This was accomplished by outlining upon the floor of the place of meeting a design in the form of a lodge. For the purposes desired a piece of chalk or blue stone was used. No matter how high or exalted his station in life it was the duty of the candidate at the conclusion of his initiation to take a mop and pail of water and carefully wash out all traces of the drawing on the floor." "It is you that have chalked forth the way that brought us hither"
Do you Love me, MASTER? No?" 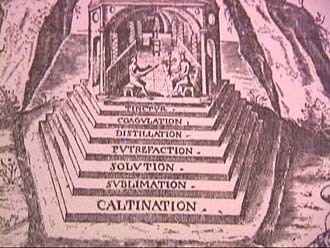 One of the main concerns of Freemasonry, as seen in the lecture of the second degree, is the emphasis on the advancement of learning and the mastery of the seven liberal arts and sciences. The symbolism regarding the advancement of learning is massively represented in The Tempest, but since I have already covered that in detail in my "Secrets of the Shakespeare Plays" I will save space here by merely referring the reader to that work. There are many more Masonic allusions in The Tempest. And there are many, many more in the remainder of the First Folio. But the foregoing should be sufficient for my purposes. I think I have shown sufficiently that not only did the three degrees of the blue lodge exist in Bacon's, but that Bacon was closely connected with the Freemasonry of his day. I would refer anyone who wants to pursue the matter further to "SHAKESPEARE Creator of Freemasonry" by Alfred Dodd, and "Bacon-Masonry" by George V. Tudhope. Freemasonry symbolism is amply represented in the Shakespeare plays. But this presents somewhat of a mystery. If Freemasonry and the Rosicrucians are so intimately related, and if Francis Bacon was connected with the Rosicrucians as well as the Freemasons, why is there no corresponding representation of Rosicrucian symbolism in the Shakespeare plays? Apparently it is not represented there at all. Or is it?